Researchers at Uppsala University in Sweden recently presented new designs for quantum dot solar cells. The novelty of the work published in ACS Nano from Zhang et al. was a design focused on using nanocrystals of a transparent material, MgZnO. This cheap and easy to manufacture nano oxide layer was employed in solar cells, achieving energy conversion efficiencies as high as 10.4%. The use of these oxide nano-crystals is an important step in solar cell research, as they are inexpensive earth abundant materials that can be solution processed (i.e. deposited by printing methods), which adds up to keeping manufacturing costs down while maintaining high solar cell performance. 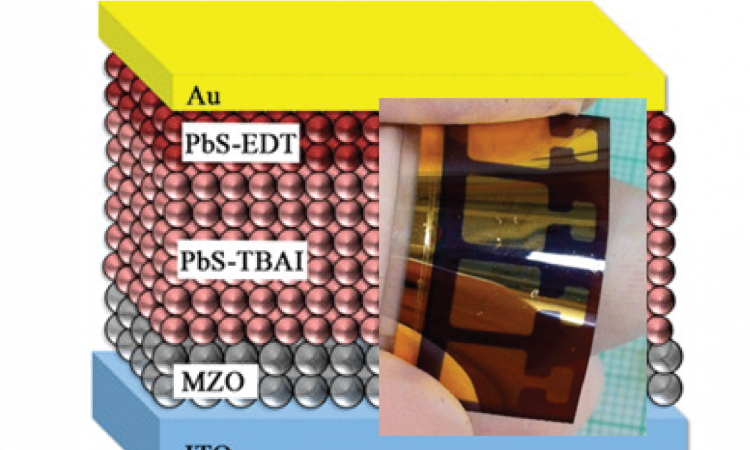 An impactful part of this work, is that the researchers made flexible solar devices which are a) super cool, because they’re flexible working solar cells b) fairly important, because the solar cells could be mass produced in an inexpensive way (think newspaper reel-to-reel style printing). On top of these application based ideas, the researchers investigated the chemistry happening when actual charge transfer occurs from the solar absorber material (PbS) to their new MgZnO layer. Quantum dot solar cells are some of the new kids on the block in solar. They first came into the spotlight in 2010, at a poor 4% energy conversion efficiency (commercial silicon panels are above 20%). In the past decade though, researchers have dug deep into devising better and smarter materials achieving energy efficiency as high as 13.4% (Figure 1). One of the attractions of quantum dot solar cells is their inexpensive cost. Quantum dots, the active absorber material, can be made into highly concentrated dyes, and these dyes could in theory decrease the manufacturing costs of solar cells. Imagine a printer spraying dye out onto large arrays of solar panels instead of the expensive silicon manufacturing process. These types of cost-effective solar cells could make solar electricity available for the masses. Quantum dot solar cells sound promising as they are cheap and efficient. So why isn’t there one on my roof? Well, not all components can be solution-processed like the quantum dots themselves. Specifically, the commonly used metal oxide electron transport layers, which the authors of this work note require temperatures of 300-400°C to produce. On top of this, their relatively low-efficiency (which is getting better), as well as issues with long-term stability, make them hard for a company to push for and invest in. There are however some start-up companies looking very intently at their commercialization (see UBIQD, QDSolar). To find a way to make a better electron transport layer that is also solution processable, the researchers looked at previous work into doping zinc oxide with magnesium to form MgZnO. The addition of magnesium makes the zinc oxide more transparent, which is important to maximize amount of light that gets to the solar absorber material (PbS in this work). The MgZnO nanoparticles were made by injecting a ligand capping agent (ethanoamine) into a hot precursor solution of zinc and magnesium salts, the result being a stable colloidal nanoparticle solution. This solution of nanoparticles was deposited sequentially with the other materials from solution (Figure 2), without the need for any high temperature steps. The result of this was being able to make solution processed solar devices that had reasonably high efficiencies. They were made onto a flexible PET substrate (polyethylene terephthalate). When tested, the devices achieved stable efficiencies up to 10.4% for the rigid solar cell and 9.4% for the flexible architecture(Fig 2). Their chemistry investigations showed efficient charge transfer from the solar absorber (PbS) to the newly utilized MgZnO particles. This is one step forward in the making of inexpensive solar cells. A new method of depositing a major component in quantum dot solar cells is demonstrated, which will certainly catch the attention of researchers working in this field. The future tasks of commercialization of quantum dot solar cells is outside of the scope of this work. Making new quantum dot absorber materials compatible with the material in the electron transport layer ( such as MgZnO in this case) will be critical to fabricate and further commercialize economically feasible devices.